A few weeks ago I was finishing up piano lessons with Miriam and decided that she didn't have quite enough to work on, but I also knew that no one in the house had patience for any more time spent on piano lessons so I said, "And just do page 59 as well. We won't go over it now; it's bedtime. You can figure it out on your own." Miriam has a good ear for the piano. She recently taught herself how to play The First Noel...by ear. She likes me to go through her songs with her so that she knows how they sound and then she'll work them until she basically has them memorized for her next lesson. Not knowing how the song sounded was frustrating for her. "I will never get it right!" she lamented during one of her practice sessions. "How am I even supposed to know how it goes if I've never heard it before?!" "You're supposed to read the music," I said. "You know how each note is assigned a line or gap on the staff?" "Alright. And you know how the different kinds of notes receive a different number of beats? For example," I said, pointing to a quarter note, "How many beats does this note get?" "That's right. So all you have to do is put that together. It's like a secret code. It's like reading." It's like a word search. This particular day he wanted to write CANDLE and BEN and WOLF. He can spell BEN on his own but he needed some help with CANDLE and WOLF. I was cleaning the kitchen while he was working at a little table in the living room so we were hollering through the house to each other over the sound of running water. "How do you spell candle?" he wanted to know. "But Mom!" he said, rushing into the kitchen. "Where do I put the D? Can-DLE. Duh-duh-duh. Can-DLE. How come you never said D?" "I did say D," I assured him. "C-A-N-D-L-E. Candle." "Mom," he snorted. "You said B. See? I wrote it down. C-A-N-B-L-E. So where does the D go? There has to be a D in candle, but I don't think there's a B..."
"Ahh, see?" I said. "You heard B but I said D. The D goes where you wrote down B." "I can fix that!" he said (and he did). We're still working on writing all his letters properly. He often writes his name BEM, or BEMJAMIM if he's feeling ambitious, and just can't seem to figure out where N stops and M begins. 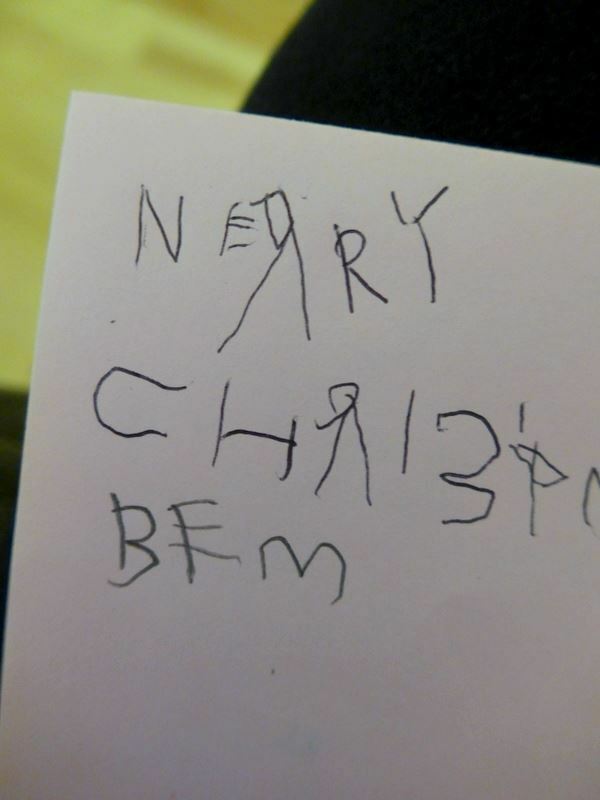 We made Christmas cards at the beginning of the month (to deliver at the retirement homes we sang at) and on one of his cards he wrote NERRY CHRISTNAS, from BEM. We had a pretty good laugh about that, but Rachel quickly stopped laughing when on her next card she wrote "Merry Christman." For her part, Rachel is still getting ready for the school-wide spelling bee. So far I haven't been able to stump her with a single word on her list...but we should probably get a bit more practice under her belt before she has to stand up and spell in front of a crowd.